Teeth whitening is a dental procedure for the treatment of stained or discoloured teeth. Most people’s teeth tend to darken with age, and there are a number of reasons why teeth maybe discoloured. At the Country Dentist we offer three systems for teeth whitening. Smartbleach® is considered the Gold Standard in laser teeth-whitening systems. A single Smartbleach® treatment gives you a long-lasting whiter smile in less than one-hour. Smartbleach® works by using a laser or Smartlight 3LT equipment to produce pure green light from the sunlight spectrum and matching this green light to a Smartbleach® patented red teeth whitening gel containing a special, non-acidic, preparation of hydrogen peroxide. Red and green are complementary colours and the consequent Smartbleach® interaction creates a non-acidic teeth whitening process. The result is a whiter, brighter teeth. Smartbleach® is also able to stabilise the smaller molecules, stopping them reforming into large ones. This means that the treatment lasts longer. A typical Smartbleach® teeth whitening treatment lasts 45-50 minutes with the new 3LT teeth whitening system or around 60 to 90 minutes with the Smartbleach laser. Firstly, the teeth are cleaned and dried by the dentist. A protective coating is applied to the gums and then the special Smartbleach® red gel is applied to the teeth and the green light is applied to the teeth. Your teeth should be assessed prior to proceeding with Smartbleach® to ensure they are suitable for bleaching procedures. An exciting aspect of Smartbleach® is the results are visible immediately, so you can judge for yourself, after each application, when you have reached the desired result. 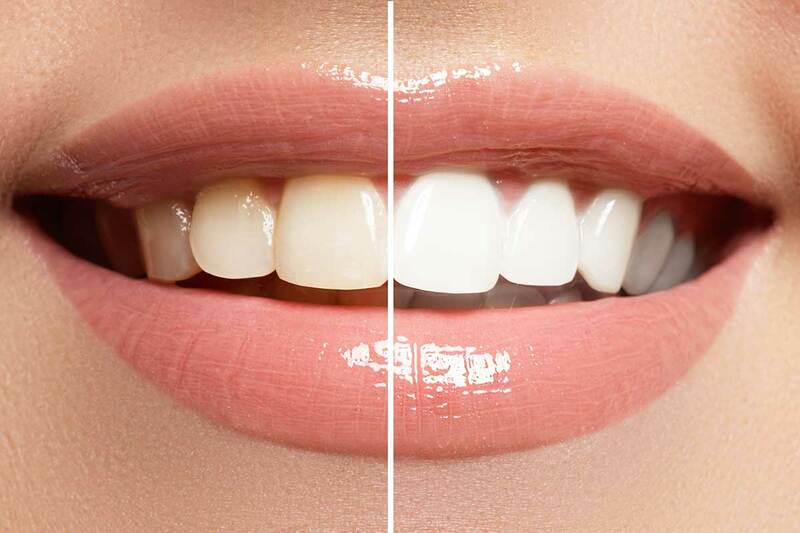 Traditional teeth whitening procedure involves using a bleaching agent in a custom-fitted tray for about 30 minutes each day over a two-week period. The teeth whitening procedure involves an initial appointment for dental impressions and examination. A second appointment involves the fitting of the custom trays along with instructions and advice on how to use the gel and trays. Whitening gel is applied to the trays and the trays worn for a about 30 minutes every day for about two weeks. Sometimes it can take six weeks to achieve the desired change and as this is a home-based system, the results are in your hands. We recommend that you return for a follow-up appointment to check your progress. The advantage of the custom tray system is that the custom trays are multifunctional and can be used to apply medicaments to your teeth, such as re-mineralising agents that enhance the strength and beauty of your tooth enamel after the bleaching procedures are finished. For those people who are on a tight budget a box of 10 applications of tooth bleaching gel for home application may be purchased, however they must attend for dental examination to assess whether their teeth are suitable for bleaching before they can proceed with bleaching. At the Country Dentist we can help you obtain that perfect smile in a way that best suits your lifestyle and your budget.